It was a Friday night, and I was walking back to my dorm. Tiffany, that cute brunette girl in my general education class that I thought was giving me all the right signals, just turned me down for a date. It didn't help that when I went to approach her, I accidentally spilled coffee all over my pants, ending any possibility of a normal conversation. After a brisk walk, and a shower of shame, I decide to take my mind off things with a little Hearthstone. Whoa! My night improves alot after I'm offered a draft full of Rares, Epics, and Legendaries. Tonight is the night. It's the night I finally get that sweet 12 win icon. Thoughts of a Lightforge key flash before my eyes. My incredibly drafted deck steamrolls its first 5 opponents. I feel invincible. After a quick bathroom break, I go back for another game. Another 7 wins in a row doesn't seem out of reach. Not with this deck. Unfortunately, life doesn't always go as planned, and my next three opponents seemingly topdeck into every answer, ending my run at 5-3. This was the deck. Why couldn't I go further? Did I really draft the best deck ever, or did that sylvanas windrunner and ragnaros the firelord mask the deficiencies I had in the rest of my deck? Did my opponents really topdeck every answer, or did they wisely hold on to their board clear until it could do the maximum amount of damage? While I was short-sighted, I was fortunate enough to keep records of my draft and my games to analyze, and quickly realized that my deck lost all 3 games because none of the awesome cards I drafted ever got into play. I ignored my early game, focusing purely on card value, and drafted an entire deck filled with late game win conditions. Unfortunately, all three of my opponents, a Warlock, a Hunter, and a Rogue were able to dispatch me before I got to late game. It didn't help that the Rogue ended my run constantly spamming Sorry. The pleasure is mine. Well, the pleasure certainly wasn't mine. How Much Gold Do You Earn? Greetings, I'm Sheng, a Legend rank constructed and infinite arena player. I run HearthstoneCoaching.com where we're dedicated to helping players improve to achieve their Hearthstone goals. This is the start of a series on the topic of advanced arena. It's for good players who've hit a plateau in their game, and want to overcome the hump from 4 to 7 wins. 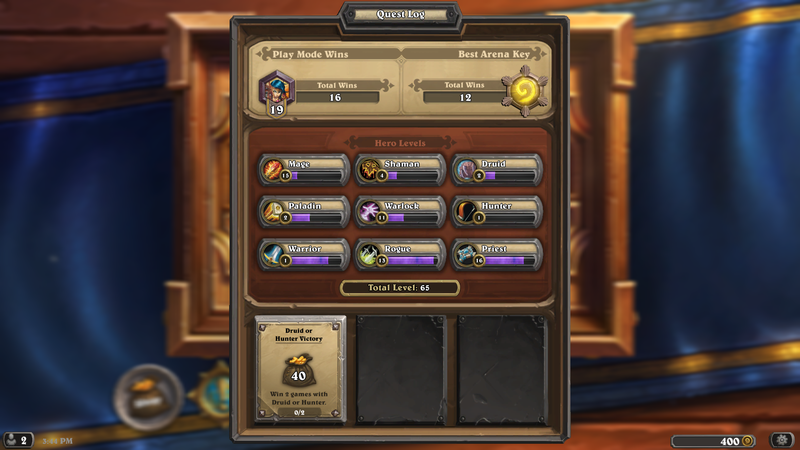 Aside from achieving 12 wins in a single run, the dream of most arena players is to be able to earn enough gold from each run to play indefinitely. So why is 7 wins so important? 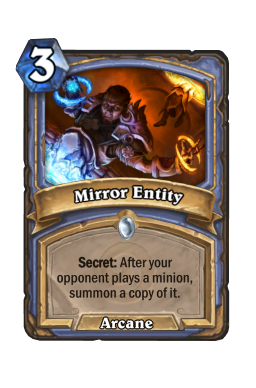 Well it's the threshhold you'll need to hit to be able to play arena indefinitely off your winnings. It's also what is known to many advanced players as going infinite. Alright, enough with the lame anecdotes. This is a guide about advanced arena right? Show me the money! On average, there's a 57% increase in the amount of gold you'll get jumping from 6 wins to 7. 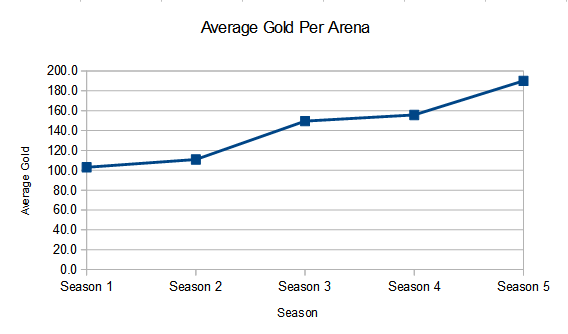 Statistically, this is the most significant increase in gold from one win to another in arena. Being able to hit this threshhold consistently is one of the most difficult things to do. How rare is this phenomenon, and how do you get there? A few months ago, Reddit user mlibbrecht calculated the probability of a player being able to hit 12 wins. 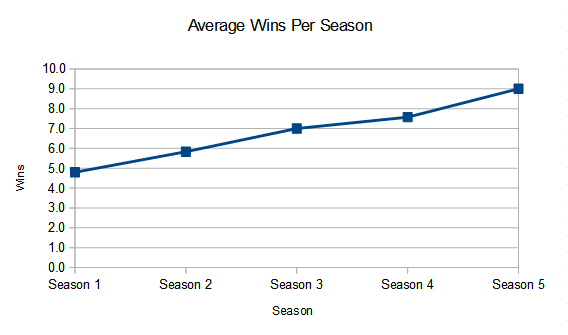 From his data, I mapped out the expected number of wins for a player at differing skill levels. For reference, Trump averages about 7.7 wins per run in arena, putting him well within the top 0.1% of all arena players, with 12 wins as his most common result. If you want to learn from someone, I'd highly recommend watching his stream or following fellow writer ADWCTA whose results are in the same ballpark. 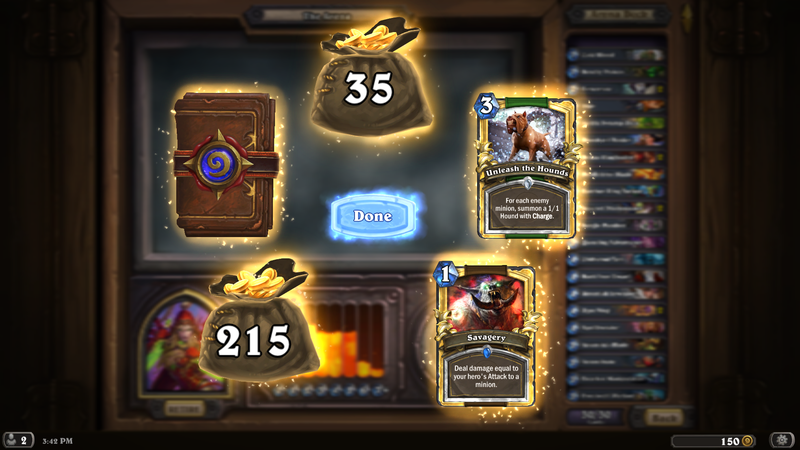 Keeping track of my arena stats from day one was probably the smartest thing I ever did in Hearthstone. By mapping my progression over time, I was able to see my strengths and weaknesses, which has helped me become a better player. While my book-keeping was simple in the beginning, nowadays, I track my entire draft from start to finish and record my match records. I started playing Hearthstone towards the end of season 1. With a very casual background in drafting from another card game called Magic the Gathering (playing with a few friends after work over beers once every few months), I started off slightly higher than the 75th percentile of all players. For most, this would be considered pretty good, but as my goal was to become an infinite player, this wasn't nearly good enough. By the end of my second season, having familiarized myself with most of the cards in the game, my rating jumped to around the 90th percentile of all players. Unfortunately, my average gold didn't increase that much, even having improved my game. It goes to show how large the gap between 6 and 7 wins is in terms of gold. By June, I had barely become an "infinite" player, earning exactly 150 gold per run. Since then, my numbers have steadily increased, but let's focus on my progression during the first two months. How did I go from a good player to an infinite one? For those of you who haven't reached the 5 win average threshold, I'd highly recommend you read my Beginner's Arena series. Using these as reference, you should be able to get there. My start to becoming an infinite player started after my first 12 win run with my friend Brian. This was back when I was a 5 win player, having just finished my first full season of Hearthstone. It was a Saturday night, and we both had one too many beers. Brian had just started playing Hearthstone, and never did an arena. Being the more experienced player, he wanted me to show him the ropes. We went through a Rogue draft together, carefully consulting a tier list, and argued over picks that were maybes. It was 2 AM, and having drafted something we both deemed reasonable, we called it a night, and agreed to go back to it in the morning when he woke up. The deck we drafted didn't look very overpowered. It had a decent mana curve, and some cute removal spells, but none of those Epic or Legendary cards you see when people post their decks on Reddit. I had fairly low expectations, and said we'd probably get 5 wins. 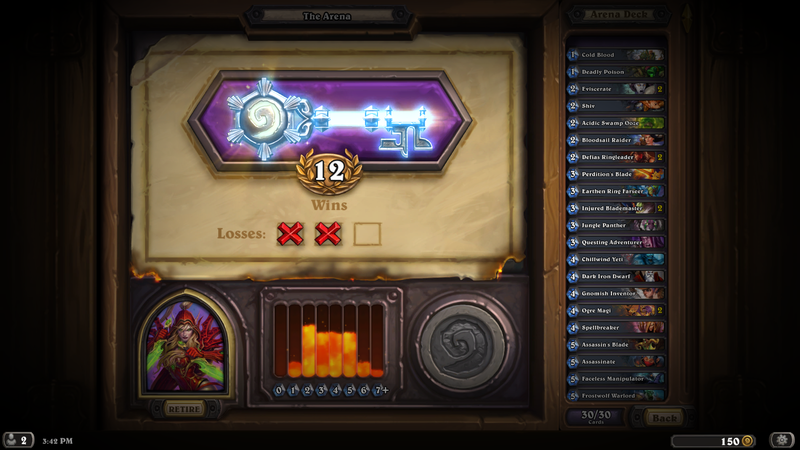 Improbably, this deck went on to win 12, on Brian's free arena ticket. While I don't remember exactly what we argued over, there were many instances during our draft together where we disagreed over which card to choose. Often this discussion forced us to look over the rest of our deck to consider if there was any synergy we'd missed by choosing one card over the other. 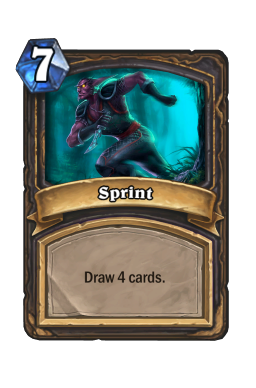 Thus, cards like sprint made the cut after we realized that our deck was early to mid-game focused and lacked sufficient card draw. Two Brians Better Than One? So what exactly did I learn from that run, that kick-started my progression to becoming an infinite arena player? Well, I realized several things: 1. I didn't plan out my entire turn ahead of time. Often I'd make the first play that comes to mind. 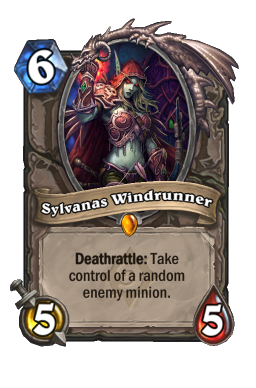 Because I'm a more conservative player, this generally means finding some way of clearing the board with my minions, causing me to miss lethal. 2.I didn't consider the answers my opponent had for my plays. Being obsessed with spending every last mana crystal, I'd often play into board clears that would blow away any advantage I'd earn in early game. This was especially painful against Mages. 3. I didn't take into account card synergy after drafting half of my cards. Before, I'd look at each card in a vacuum against the two other cards I was offered. Doing this meant that I basically ignored mana curve and card synergy when choosing which cards to place in my deck. 4. I didn't make the plays that enabled me to win games when I was behind, but instead made what looked like the best play for that turn. There were often times during our 12 win run together when Brian would ask me "so how are we going to win this?" Often I'd be too caught up in figuring out how to clear the board to think ahead. Also, there were instances where we'd be ahead in terms of minion count, but basically run out of gas towards the end of games due to our low mana curve deck. Brian pointed this out a few times during our games and suggested we attack our opponent instead of trying to gain board control. This proved to be crucial in our last game against Mage, where we top-decked an ogre magi that allowed our eviscerate s to deal 10 damage to our opponent's face, ending the game. The first step to becoming a better player is understanding where your weaknesses lie. Without this knowledge, you'll never be able to improve in a meaningful way. Here's an anecdote from when I used to play Table Tennis obsessively: My first coach was a very good player from China. He trained in a state system, where each student was generally molded into the same type of player. In this system, coaches emphasized drills and fitness more than anything else. After spending several months with this coach, I learned the basics, and improved a lot. I was also in great shape as well, going from being unable to do multiple push-ups at a time, to over 50 at once. My standards were basically the same as any military infantryman in the US Army at my age, and I had that chart pinned against my wall during the entire time I practiced with this coach. Later, I moved, and found another coach. This coach was also extremely qualified in his own right, having played in Europe semi-professionally in the 80s. I expected my first session to be like the ones with my previous coach--an entire hour of looping balls back and forth at breakneck pace. Instead, I was surprised to find that most of the practice was focused on tactics, strategy, and discovering holes in my game. While I was in great shape, I had an extremely difficult time recovering from my shots. My old coach mentioned that this was because I wasn't fast enough, but my new coach noticed that my feet weren't set properly between shots, making me a half-second slow in recovery. I improved tremendously, and took my game to another level. So how does this story relate to Hearthstone? Well, basically, if you can't analyze your own mistakes (I certainly couldn't), and can't find a great coach to point them out, then you should play with a friend and be critical of each other's plays. You might just find holes in each other's game that you never discovered before.